DCNS, a world leader in naval defence, and Airbus Helicopters, the world’s leading helicopter manufacturer, are joining forces to design the future tactical component of France’s Naval Aerial Drone (Système de Drones Aériens de la Marine – SDAM) programme. By pooling naval and aerospace skills and expertise, the teaming of DCNS and Airbus Helicopters will be equipped to address all technical challenges arising from the naval integration of the drones through the creation of a robust system architecture that can evolve and adapt to meet every need. For DCNS, drones are the roving eyes of the battle system; their missions are overseen by each ship’s combat management system, ensuring increased effectiveness in real time in support of naval operations. Offering a genuine tactical advantage, the VTOL (Vertical Take Off and Landing) drone is an organic component of warships and augments the operational potential of naval forces. DCNS CEO Hervé Guillou said: «We will continue to innovate in these areas and give drones the capability to perform increasingly complex missions over greater distances and timeframes in an interoperable environment with increased digitalisation of resources. Such digitalisation hinges on the roll-out of cybersecurity solutions that offer better protection of data and communications between drones and ships». DCNS’s role in the partnership will be to design and supply the entire warship-integrated VTOL drone system. DCNS will design and develop the solutions for the ship-based operation and integration of the drone, including the specification and validation of the payloads and mission data links. DCNS will also produce the drone’s mission system, which will enable real-time management of its operations and allow its payloads to be controlled through the combat management system. Over the last ten years, DCNS has successfully overseen the French armaments procurement agency (DGA) and French Navy’s main aerial drone study and trial programs, operating both on its own and in partnership. 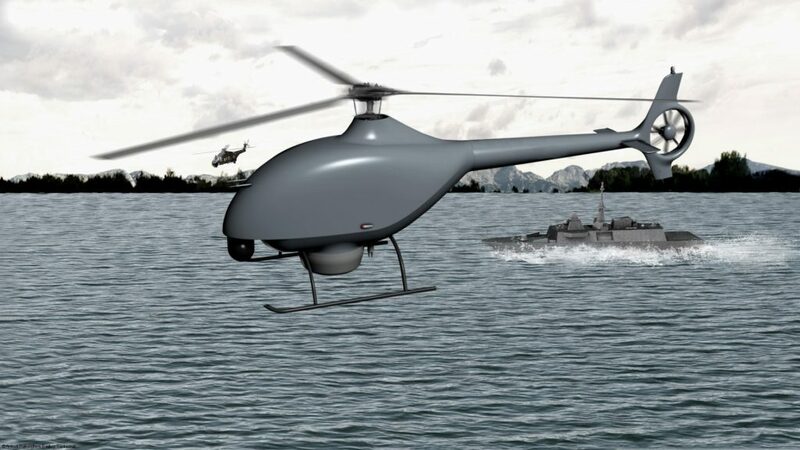 In the process, the Group has acquired know-how that is unique in Europe and possesses solutions for integrating aerial drone systems in warships or enabling them to operate on ships. These solutions have been tested at sea. A versatile and affordable platform, the VSR700 has been developed by Airbus Helicopters with a view to providing military customers with a solution that leverages a tried and tested civil aircraft and strikes the best possible balance between performance, operational flexibility, reliability and operating costs. Harnessing autonomous flight technologies that have been tested by Airbus Helicopters through a range of demonstration programs, the VSR700 is derived from a light civil helicopter, the Cabri G2 (developed by the company Hélicoptères Guimbal), which has proven its reliability and low operating costs in service. Under the terms of the partnership, Airbus Helicopters will be responsible for designing and developing the VSR700 drone as well as the various technologies needed for drones to perform aerial missions, such as data liaison, payload and a “see and avoid” capability enabling the drone’s integration into airspace. «Rotary-wing drones will play a crucial role in tomorrow’s air/sea theatres of operation, performing the role of a roving eye and extending the coverage of surface vessels over the horizon», said Airbus Helicopters CEO Guillaume Faury. «This partnership will see Airbus Helicopters pool its expertise in vertical flight and autonomous flight technologies with the skills DCNS possesses in naval combat systems, allowing us to respond to the emerging needs of our customers». Thanks to the VSR700’s specifications, the system boasts superior endurance and payload performance to any comparable system used to date. The device offers big capability with a small size and logistics footprint, resulting in less maintenance and straight forward integration to a broad range of surface vessels.